the number of his name (666). The same Greek word translated as name (onoma: G3686) that appears in Revelation 13:17-18 is also used in chapter 19:16, so clearly the word can also apply to a title, and not just one man's name. Now, we are told that it takes a certain understanding and wisdom to discern just how this number is actually applied. Based on the fact that 666 can apply to a title, below are several words and phrases that have been put forth over the centuries as probable solutions to the enigma of 666. The numeric equivalents of Greek letters can also be found in the Encyclopedia Britannica under "Languages of the World", Table 8. NOTE: Latin is the official language of the Roman Catholic Church. Church Documents are usually published first in Latin, and then translated from the Latin into other languages. The association of "Lateinos" with 666 was first suggested by Irenæus (ca. 130-202 A.D.) who proposed in his Against Heresies that it might be the name of the fourth kingdom in Daniel 7:7. Source: Against Heresies, by Irenæus, Book 5, chapter 30, paragraph 3. St. Irenaeus biography online at the New Advent Catholic web site. * Stigma is a now obsolete Greek character, but it appears in the New Testament in Rev 13:18 to give the value 666 (chi xi stigma - See Strong's Concordance, # G5516). The numeric equivalents of Hebrew letters can be found in the Encyclopedia Britannica under "Languages of the World", Table 50. Lateinos, Ecclesia Italika, and Romith are cited as possible solutions by Johannes Gerhard (1582-1637), a Lutheran, in his Adnotationes in Apocalypsin, page 110. Romith, Vicarius Filii Dei, Dux Cleri, Ordinarius Ovilis Christi Pastor, and Dic Lux are cited by the rector of Berlin, Andreas Helwig [or Helwich] (1572-1643) in his Antichristus Romanus. Dux Cleri is cited by Walter Brute (or Britte), a fourteenth century follower of Wycliff, in his Registrum, page 356. Ludovicus was proposed by James Bicheno (d. 1831), a British minister and author, applying it at the time to the French King Louis XIV, as the two-horned beast from the earth. He Latine Basileia and Lateinos are cited by Alexander Campbell (1788-1866), founder of the Disciples of Christ, in A Debate on the Roman Catholic Religion of 1837. See The PROPHETIC FAITH OF OUR FATHERS, The Historical Development of Prophetic Interpretation, by Le Roy Edwin Froom, Volumes II and IV, published by the Review and Herald Publishing Association, Washington D.C., Copyright 1948. This relationship of 666 in Greek, Latin, and Hebrew is only one relatively small, yet important indicator that the Papacy is the Antichrist and the beast from the sea of Revelation 13. This association by itself proves little, as 666 can fit other people using the same methods. All the other biblical characteristics of the Antichrist must be considered and met as well, then this association becomes significant. Some will suggest that the book of Revelation was written only for those living at the time, and that 666 most probably applies to Cæsar Nero, who ruled Rome from 54 to 68 A.D., rather than someone from latter centuries. This point of view, which suggests Revelation had an immediate application to the first century, rather than being prophetic, is known as preterism, and is commonly held by the Catholic Church. So, just how is Nero linked to 666? There is a problem though with the above calculation. According to the rules of Jewish numerology, known as gematria, when the letter Nun appears a second time in a word, it is known as a "Final", and takes the value of 700. * So to be precise, NRWN QSR actually adds up to 1316 and not 666. *Source: Behind Numerology, by Shirley Blackwell Lawrence, copyright 1989, published by Newcastle Publishing Co., Inc., North Hollywood, California, ISBN 0-87877-145-X, page 41. So the preterist calculation which attributes 666 to Nero, however, is nothing more than a rather desperate attempt to find some likely candidate for the Antichrist other than the Papacy. 473. anti, an-tee'; a prim. particle; opposite, i.e. instead or because of (rarely in addition to):--for, in the room of. Often used in composition to denote contrast, requital, *substitution*, correspondence, etc. An example of how anti is used this way can be found in the words type and antitype, which are used with respect to Bible prophecy. The "type" is the pattern or symbol, and the antitype is the fulfillment. The Jewish Passover was a "type" and the crucifixion of Jesus is the "antitype" or fulfillment of the example of the type. You substitute the antitype into the symbolism of the type to arrive at the complete meaning. The Catholic Church has essentially confirmed this usage of the word anti. In the 1994 Catholic Almanac on page 158 there is "the list of men who claimed or exercised the papal office in an uncanonical manner." So these men tried to substitute themselves for the true Pope, and usurp that office, so to speak. The Catholic church denies the papal authority of the men on that list because they attempted a substitute (false) claim on the Papacy. That list is a list of ANTI-POPES! So the word anti can clearly mean a substitute for something. Antichrist (word 500 in Strong's Greek dictionary) can be correctly interpreted then, as someone who substitutes himself for Jesus Christ, the Son of God, just as an antipope substituted himself into the office of the Papacy. "Vicar of Christ . . . Title used almost exclusively of the Bishop of Rome as successor of Peter and, therefore, the one in the Church who particularly takes the place of Christ; but used also of bishops in general and even of priests. First used by the Roman Synod of A.D. 495 to refer to Pope Gelasius; more commonly in Roman curial usage to refer to the Bishop of Rome during the pontificate of Pope Eugene III (1145-1153). Pope Innocent III (1198-1216) asserted explicitly that the Pope is the Vicar of Christ; further defined at the Council of Florence in the Decree for the Greeks (1439) and Vatican Council I in Pastor Aerternus (1870). The Second Vatican Council, in Lumen Gentium , n.27, calls bishops in general "vicars and legates of Christ." All bishops are vicars of Christ for their local churches in their ministerial functions as priest, prophet, and king, as the Pope is for the universal church; the title further denotes they exercise their authority in the Church not by delegation from any other person, but from Christ Himself." Source: Catholic Dictionary, Peter M.J. Stravinskas, Editor, published by Our Sunday Visitor, Inc., Huntington, 1993, pp. 484-485. Now look up the word vicarious in almost any common dictionary. Here is what you would find in the Webster Handy College Dictionary: "substituting for or, feeling in place of another." 1. A parish priest in the Church of England. 2. A cleric in the Episcopal Church in charge of a chapel. 3. One who serves as a *substitute* for another. A Vicar General is defined in the 1994 Catholic Almanac on page 330 as "a priest or bishop appointed by the bishop of a diocese to serve as his deputy, with ordinary executive power, in the administration of the diocese." So a vicar serves in the place of (substituting for) the bishop, and assumes his power of office for certain duties. So the Papal title of VICAR OF CHRIST which in Latin is VICARIUS CHRISTI, means a SUBSTITUTE FOR CHRIST, which is synonymous with Antichrist, i.e., assuming the power of God on earth! This blasphemous claim is made repeatedly by various Popes and is the very foundation of Roman Catholicism and it's Papacy. Some Catholics may protest that the Pope represents, but does not substitute for Jesus Christ, to avoid the association. 2. play the role of; impersonate. 3. denote; symbolize; stand for. 4. speak and act for; *be a substitute for*. 6. be composed of; consist in. Clearly then, Vicar of Christ (Vicarius Christi) and Antichrist have exactly the same meaning. The Pope substitutes himself in place of God on earth, and that is *exactly* the meaning of Antichrist. Some Catholics will claim that the title VICARIUS FILII DEI is an anti-catholic fabrication, a complete fake, never used by the Catholic church. One example of this is online at the Catholic Envoy Magazine in the article titled Pope Fiction by Patrick Madrid (See Fiction 5). My complete discussion with Patrick Madrid. The following evidence is offered to prove that VICARIUS FILII DEI is indeed genuine. * St. Matt. xxvii. 42. * St. John xiv. 29.
out the whole unity of the Catholic Church in the hearts and convictions of its members; and that by a double process, not only by its own proper evidence, not only by the light of God's dealing with the world, but by contrast. For the nations of Europe have already seen that the society of the world, without the guidance and preservation of the Church of God, resolves itself into confusion. They have seen every form of political society, and the confederations of kingdoms and nations, dissolve and pass away. While all the floating societies of the world have drifted down the stream, the centre of obedience has become more stable. Men have learned from the history of modern Europe that the law which is called the law of nations—that is, the rule of justice which regulates the relations of people with people—has become weak and powerless. And why? Because the nations have broken the bonds which bound them to the centre of obedience, and have shaken off the noble submission to a tribunal higher than man, from which came forth, in other days, the judgments of equity and of justice. It was a dignified obedience to bow to the Vicar of the Son of God, and to remit the arbitration of their griefs to one whom all wills consented to obey. Source: The Temporal Power of the Vicar of Jesus Christ, by Henry Edward Manning, D.D. (appointed Archbishop of Westminster in 1865 and Cardinal in 1875), second edition with a preface, published in 1862 in London by Burns & Lambert, 17 &18 Portman Street. [pg. 3] The leader of the Catholic Church is defined by the faith as the Vicar of Jesus Christ (and is accepted as such by believers). The Pope is considered the man on earth who represents the Son of God, who "takes the place" of the Second Person of the omnipotent God of the Trinity. [pg. 13] The Pope is not the only one who holds this title. With regard to the Church entrusted to him, each bishop is Vicarius Christi. Note that on page three of the Pope's book, "represents the Son of God" is synonymous with "Vicar of Jesus Christ". A vicar clearly represents, substitutes for, or "takes the place" of another, as stated. Consequently "represents the Son of God" can be translated in Latin as Vicarius Filii Dei, which in Roman Numerals will add up to 666. The title Vicarius Christi, translated into English, means a substitute for Christ, i.e., Antichrist, as demonstrated above, which is applied by the Pope to every bishop of the Catholic Church! The Donation of Constantine is the most famous forgery in European history. Originally discovered in the Pseudo-Isidorian Decretals in the 9th century (c. 847-853), which are now also recognized to be forgeries, parts of the Donation of Constantine were later incorporated into most of the medieval collections of Catholic canon law (Anselm's, Cardinal Deusdedit's (c. 1087), and Gratian's Decretum (c. 1148) also known as Concordia Discordantium Canonum). So the Donation of Constantine was held to be genuine for centuries. choosing that same chief of the apostles and his vicars to be our constant intercessors with God. And to the extent of our earthly Imperial power, we have decreed that his holy Roman Church shall be honored with veneration, and that more than our empire and earthly throne the most sacred seat of the Blessed Peter shall be gloriously exalted, we giving to it power, and dignity of glory, and vigor, and honor imperial. And we ordain and decree that he shall have the supremacy as well over the four principal seats, Alexandria, Antioch, Jerusalem, and Constantinople, as also over all the churches of God in the whole earth. And the Pontiff, who at the time shall be at the head of the holy Roman church itself, shall be more exalted than, and chief over, all the priests of the whole world, and according to his judgment everything which is provided for the service of God and for the stability of the faith of Christians is to be administered. Source: Donation of Constantine, quoted in Christopher B. Coleman's The Treatise of Lorenzo Valla on the Donation of Constantine, pp. 12,13 Copyright 1922 by Yale University Press, New Haven, Conn.
"Beatus Petrus in terris vicarius filii Dei videtur esse constitutus." Decretum Gratiani, prima pars., dist. 96. - C. XIV. De eodem. The first pope who used it in an official act and relied upon, was Leo IX; in a letter of 1054 to Michael Cærularius, Patriarch of Constantinople, he cites the "Donatio" to show that the Holy See possessed both an earthly and a heavenly imperium, the royal priesthood. ... Gregory VII himself never quoted this document in his long warfare for ecclesiastical liberty against the secular power. But Urban II made use of it in 1091 to support his claims on the island of Corsica. Later popes (Innocent III, Gregory IX, Innocent IV) took its authority for granted (Innocent III, Sermo de sancto Silvestro, in P.L., CCXVII, 481 sqq. ; Raynaldus, Annales, ad an. 1236, n. 24; Potthast, Regesta, no. 11,848), and ecclesiastical writers often adduced its evidence in favour of the papacy. The medieval adversaries of the popes, on the other hand, never denied the validity of this appeal to the pretended donation of Constantine ... The authenticity of the document, as already stated, was doubted by no one before the fifteenth century. Source: The 1913 Catholic Encyclopedia online at the New Advent web site. 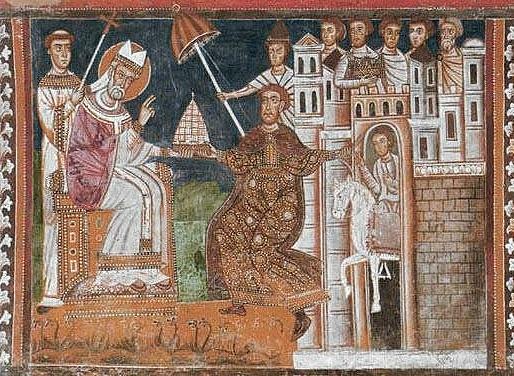 In the Chapel of St. Sylvester (part of the Basilica of Santi Quattro Coronati, located in Rome on Coelian hill, between St. John Lateran and the Coliseum), a series of frescoes commissioned by Pope Innocent IV, and completed in 1246, depict various events in the life of Pope Sylvester I. The Donation of Constantine, Santi Quattro Coronati, Rome. In one of the fresco panels, shown above, Emperor Constantine is offering his crown to the Pope, illustrating the Donation of Constantine. In the following panel, the triumphal Pope, riding on horseback, is led through Rome by the humbled Emperor, who is on foot. Another painting representing the Donation of Constantine, shown below, is in the Vatican, in the Sala di Costantino. It was painted by Raphael and his workshop from 1519 to 1525, along with depictions of Constantine's baptism, his vision of the cross, and his victory at the battle at Milvian bridge, so at the time it would seem the Donation of Constantine was still considered to be genuine. Gianfrancesco Penni, in the Sala di Costantino, the Vatican. Copyright 1996 by Calmann & King, Ltd., ISBN 0-8109-2718-7, page 158. I have at hand Lorenzo Valla's proof that the Donation of Constantine is a forgery. Good heavens, what darkness and wickedness is at Rome. You wonder at the judgment of God that such unauthentic, crass, imprudent lies not only lived, but prevailed for so many centuries, that they were incorporated in the canon law ... and became as articles of faith. I am in such a passion that I scarcely doubt that the pope is the Antichrist expected by the world, so closely do their acts, lives, sayings, and laws agree. Source: The Art of Renaissance Rome, by Loren Partridge, published by Harry N. Abrams, Inc., New York, A Times Mirror Company, Copyright 1996 by Calmann & King, Ltd., ISBN 0-8109-2718-7, page 159. The forged Pseudo-Isidorian Decretals, among which was found the Donation of Constantine, are fictitious letters alleged to be from early popes [Clement (A.D. 100) to Gregory the Great (A.D. 600)], collected by Isidore Mercator in the 9th century. Since the scholarly criticism of the fifteenth century they have been known to be forgeries and have been called "Pseudo-Isidorian Decretals" or False Decretals, to acknowledge that they are fraudulent, none the less, as late as1580 the official edition of the Corpus Juris, upheld the genuineness of the False Decretals. Catholics finally abandoned the defense of the authenticity of the Donation of Constantine shortly after Cesare Baronius published his Ecclesiastical Annals in 1592, which admitted the fraud, although the Donation and title Vicarius Filii Dei continued to appear in Canon law and other Catholic publications well into the 19th century. Full scanned pages from Prompta Bibliotheca. According the 1913 Catholic Encyclopedia, a further revised edition of Prompta Bibliotheca was published in Rome by the presses of the Vatican's Office of Propaganda in 1899. 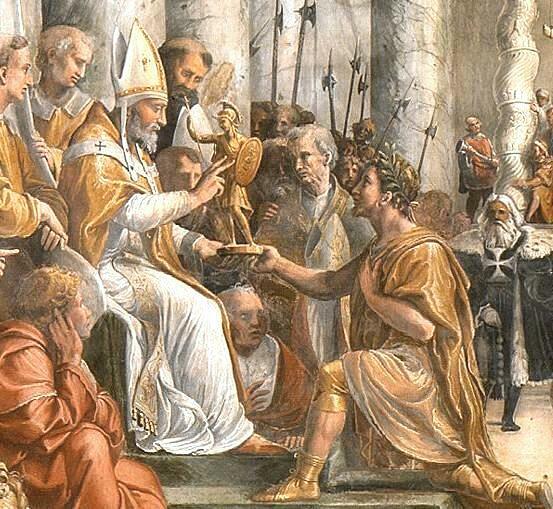 So, for well over 600 years, the Donation of Constantine was held by the Roman Catholic Church to be a valid document transferring authority from Emperor Constantine and it does contain the Latin title Vicarius Filii Dei. This is irrefutable proof that it is not a Protestant invention. The title continued to appear in Catholic publications even into the 20th century. Is it true that the words of the Apocalypse in the 13th Chapter, 18th verse refer to the Pope? The words referred to are these "Here is wisdom. He that hath understanding, let him count the number of the beast. For it is a the number of a man: and the number of him is six hundred sixty-six." The title of the Pope in Rome is Vicarius Filii Dei. This is inscribed on his mitre[*]; and if you take the letters of his title which represent Latin numerals (printed large) and add them together they come to 666. Quod erat demonstrandum, namely, that Rev. Ernest R. Hull is Anti-Christ, or the Beast of the Apocalypse!" Perhaps a little ingenuity with your name will show that you are the beast of the Apocalypse too. View a facsimile copy of the above item online. The top of page one. Editorial information from page 2. Contains sanctions for the editor from Pope Pius X, dated May 17, 1914; from Archbishop John Bonzano of Melitene, the Apostolic Delegate to the U.S., dated April 27, 1913; and from H. J. Alerding, Bishop of Fort Wayne, Indiana., dated March 29, 1912. What are the letters supposed to be in the Pope's crown, and what do they signify, if anything? The letters inscribed in the Pope's mitre are these: Vicarius Filii Dei, which is the Latin for the Vicar of the Son of God. Catholics hold that the church which is a visible society must have a visible head. Christ, before His ascension into heaven, appointed St. Peter to act as His representative. Upon the death of Peter the man who succeeded to the office of Peter as Bishop of Rome, was recognized as the head of the Church. Hence to the Bishop of Rome, as head of the Church, was given the title "Vicar of Christ." Enemies of the Papacy denounce this title as a malicious assumption. But the Bible informs us that Christ did not only give His Church authority to teach, but also to rule. Laying claim to the authority to rule in Christ's spiritual kingdom, in Christ's stead, is not a whit more malicious than laying claim to the authority to teach in Christ's name. And this every Christian minister does. What application has the number 666 to Pope Benedict XV? —None whatever. Such an interpretation of Chapter XIII, Verse 18 of the Apocalypse is entirely unfounded and is nothing more than a display of malignant hatred. It is the effervescense of vacuous minds. Earlier commentators spent considerable time in trying to determine the personality of the beast, and they referred it to Nero Caesar; for by supplying the numerals for the Hebrew characters in his name, the number 666 was obtained. During the period of the Reformation and for years after, the Apocalypse furnished the basis of much political and religious incrimination. In later years, really reliable commentators have ceased the silly prattle about the Popes, Napoleon, Rome and subjecting the Book to the Rules of exegesis see a reference to conditions existing at the time of St. John. (This interpretation, of course, does not include the Resurrection, the millennium, and the plagues preceding the consummation of the world, as referring to principle events in the first century). In a "Dictionary of the Bible" edited by William Schmidt, a Protestant author, page 1038, will be found the following; "Ebrard reckons that not less than eighty systematic commentaries are worthy of note, and states the less valuable writings on this inexhaustible subject are unnumbered if not innumerable. Fanaticism, theological hatred, and vain curiosity may have largely influenced their composition." Also on page 1039 we find the following: "Against the Historical scheme it is urged, that its advocates differ very widely among themselves; that they assume without any authority that the 1260 days are so many years; that several of its applications—e.g., of the symbol of the ten-horned beast to be the Popes, and the sixth seal to the conversion of Constantine—are inconsistent with the context; that attempts by some of this school to predict future events by the help of Revelation have ended in repeated failures. 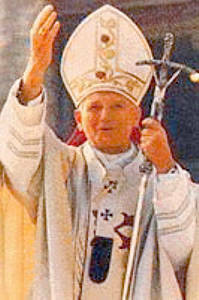 Besides, if present-day writers are so anxious to see the fulfillment in the person of the Pope, why not be consistent? 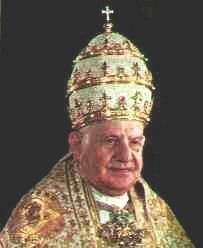 Such interpreters have never shown that the title "Vicarius Filii Dei" is really inscribed upon the Pope's tiara. Moreover, the passage states that the number refers to a man, in other words the numerals represented by the letters in his name, which total the sum 666. The words Vicarius Filii Dei are not the name of the Pope, they do not even constitute his official title. The name of our President is Woodrow Wilson. His title is President of the United States. If we take the name Benedict XV and follow out the same numerical addition, we find that his number instead of being 666 would be 1123. Since the war fanatical "private interpreters" have made the number 666 refer to the Kaiser; others even to President Wilson. The University of Notre Dame has the above editions of Our Sunday Visitor on microfilm. "Mrs. A.," said Miss Emmons, "I saw a very curious fact the other day; I have dwelt upon it much, and will mention it. A person, lately, was witnessing a ceremony of the Romish Church. As the Pope passed him in the procession, splendidly dressed in his pontifical robes the gentleman's eye rested on these full, blazing letters in front of his miter: "VICARIOUS FILII DEI," the Vicar of the Son of God. His thoughts, with the rapidity of lightning, reverted to Revelation 13:18." "Will you turn to it?" said Mrs. A. Alice opened the New Testament, and read: 'Let him that hath understanding count the number of the beast: for it is the number of a man; and his number is Six hundred threescore and six.' She paused, and Miss Emmons said, "He took out his pencil, and, marking the numerical letters of the inscription on his tablet, it stood 666." Here we have indeed the number of a man, even the "man of sin" and it is a little singular, perhaps providential, that he should select a title which shows the blasphemous character of the beast, and then cause it to be inscribed on his miter, as if to brand himself with the number 666. Source: Thoughts, Critical and Practical on the Book of Revelation, by Uriah Smith, published in 1865 by the Steam Press of the Seventh-day Adventist Publishing Association, Battle Creek Michigan, pgs. 225-226. I have received what seems to be reliable information that a photo may exist (similar to the one below) of a papal funeral in St. Peter's Basilica near the beginning of the 20th century, in which the tiara inscribed with Vicarius Filii Dei can be seen . Combined with the above claims of Our Sunday Visitor, this would indicate that it was the funeral of either Leo XIII (1878-1903), or Pius X (1903-1914), and that previous popes probably wore the tiara in question. If anyone can turn up this photo and make it available to me, I will post it in this article. 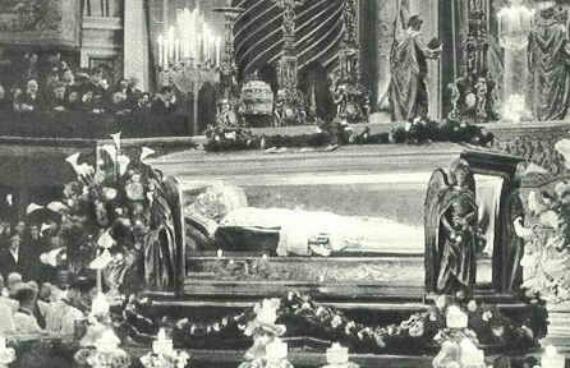 The body of Pope Pius X (who died in 1914) on display in front of St. Peter's high altar during a Pontifical Mass on May 30th, 1954, celebrating his canonization as a Saint the prior evening. A papal tiara can be seen on top of the glass-sided casket. Eyewitness testimony claims that Pope Gregory XVI (1831-1846) wore the inscribed tiara on Easter Sunday of 1845, and that the word Vicarius was on the top crown, Filii on the middle, and Dei on the lower crown, the words spelled out with jewels. See The Number of his Name. The solemn pontifical Mass celebrated by the pope in St. Peter's has some peculiar ceremonies. ... The pope, wearing the falda, amice, alb, cincture, pectoral cross, stola, cope (mantum), and tiara is carried into the basilica on the sedia gestatoria under the canopy and with the two flabella borne on either side. ... The pope returns to the altar to finish the Mass. After the blessing the assistant priest publishes the plenary indulgence. At the end of the last Gospel the pope goes to the sedia gestatoria, puts on the tiara, and returns in procession as he had entered. Source: The 1911 Catholic Encyclopedia Online, volume 12. 345. I have heard that he [the pope] is Anti-Christ, and that he was described by St. John as 666, the numerical equivalent of the Latin words of the Pope's title, Vicarius Filii Dei. That interpretation is absurd, and rejected by all reputable scholars, Catholic and non-Catholic alike. In any case, St. John wrote in Greek, and there is no warrant whatever for the translation to the Latin language. Moreover, whatever be the true interpretation of this mystical number, it certainly refers to some one individual being. If it referred to one particular Pope, it could refer to none of the others. To which Pope will people refer it? To a past Pope? Then he is dead and gone, and we need not worry about him. To the present Pope? He is the very antithesis of all the conditions of the Beast as described by St. John. However, the number does not refer to any of the Popes at all. Source: Radio Replies, First Volume, by Rev. Dr. Leslie Rumble, M.S.C. and Rev. Charles Mortimer Carty, Copyright 1938, printed by Radio Replies Press, St. Paul 1, Minn., U.S.A., #345, page 80. So Catholics themselves originally used the phrase VICARIUS FILII DEI in the forged document known as the Donation of Constantine that was held to be genuine for many hundreds of years and Catholics continued to claim that VICARIUS FILII DEI was inscribed on one of the papal mitres as recently as 1915. That Latin title was also apparently mentioned at papal coronations, and the title was not denied in print by Catholic apologists as recently as 1938. I would also suspect, but cannot prove, that there are many documents in the archives of the Catholic Church that contain the exact wording in Latin as described. An anecdote I can relate to you applies here. In discussing 666 with a fellow coworker one day, he told me that he used to be in training to be a Catholic Priest, and in class one day the priest told the prospective inductees that there was no way to disprove that 666 applied to the papal title, and they would have to live with that fact if they wanted to be priests, or drop out. My friend did not go on to be a priest, though he may have quit for other reasons. This identification of 666 with the Papal title of Vicarius Fill Dei first surfaced in print in the year 1612 A.D. in a book by Andreas Helwig called The Roman Antichrist. So the Roman Catholic Church has had over 380 years to conclusively prove it false, yet they have not done so. Why? Because it is true?! The letter "w" in this case, is proposed to be the equivalent of a double "v" or "u", which has a value of 5 and is therefore 10 when doubled.. However, in Latin, a single "v" was used to represent the "w", "v" and "u" sound, the double-u (w) apparently evolved many centuries later in other languages. So, it would seem the correct rendering in Latin would be ELLEN GOVLD VHITE, which does not add up to 666. Be that as it may, lets accept the calculation as stated above. Does this indicate that Ellen White is a likely candidate for the antichrist or beast described in Revelation 13? Using the same method of calculation, it should be apparent that there might be literally thousands of names that add up to 666, as Rev. Ernest R. Hull demonstrated in the Our Sunday Visitor article above. So obviously the application of the number to any single individual is admittedly quite meaningless, unless and until all the other characteristics of "the antichrist" can be adequately met. Even the Catholics that raise this issue are unlikely to suggest that they seriously consider Ellen White to be the antichrist entity that scripture warns about. 2 Thess 2:4 Who opposeth and exalteth himself above all that is called God, or that is worshipped; so that he as God sitteth in the temple of God, showing himself that he is God. Scholars generally agree that the "man of sin" in 2 Thessalonians 2:3 is the same entity described in Revelation as the beast whose number is 666, the "little horn" power of Daniel 7, and the harlot riding the beast in Revelation 17. See the table in The Catholic Origins of Futurism and Preterism. To my knowledge, no Catholic or Protestant scholar has ever proposed that this "antichrist" entity could potentially be a woman. So who then is a likely candidate? Scholars agree that the Bible is clear about a "man of sin" who will substitute himself for God in the very temple of God. While most of the Christian community has been told to look for a man in the future that will fit this characteristic of Antichrist, the Vicar of Christ has already precisely fulfilled this prophecy for centuries! When the Pope speaks "ex-cathedra", which means from Peter's chair, Catholic's are bound to believe his decree as though it were given from God himself! So as the Vicar of Christ, the Pope speaks from Peter's chair, in the Cathedral of God, declaring himself to be infallible in defining and declaring unbiblical doctrines which he claims to be essential to salvation as though he were God! Is this not an exact and precise fulfillment of 2 Thessalonians 2:4 identifying the Papacy as the Antichrist? But the supreme teacher in the Church is the Roman Pontiff. Union of minds, therefore, requires, together with a perfect accord in the one faith, complete submission and obedience of will to the Church and to the Roman Pontiff, as to God Himself. Source: Pope Leo XIII, Encyclical Letter, “On the Chief Duties of Christians as Citizens,” dated January 10, 1890, trans. in The Great Encyclical Letters of Pope Leo XIII (New York: Benziger, 1903), p. 193. Here is the same encyclical SAPIENTIAE CHRISTIANAE online. See paragraph #22 for the above quote. "The ancients claimed that God works by mathematics. Their religion was a conglomeration of religion, astrology, alchemy, physical and mental science, and mathematics. Ancient astrology divided the starry heavens into 36 constellations. These were represented by different amulets called "Sigilla Solis," or the sun seal. These amulets were worn by the pagan priests, and they contained all the numbers from 1 to 36. By these figures they claimed to be able to foretell future events. These amulets were usually made of gold, yellow being the sun color. While being carried, these amulets were wrapped in yellow silk, as it was thought that the bearer would thus receive the beneficial powers believed to emanate from the jewel." "These drawings from photographs taken in 1910, show actual amulets then in the Berlin Museum. They reveal the veneration the ancients had for the sun-god. On the front side of No.1 we see the god of the sun standing on the lion. This indicated the sun's position in the constellation of Leo during the hot days of August. On the back is inscribed "Nachyel," meaning "intelligence of the sun," and in 36 squares are arranged the numerals 1 to 36 (see table 1) in such a way that adding the numbers of any column either horizontally or vertically, and also the two diagonals crossing the square, the total is the same- 111. The sum of the six columns, computed either horizontally or vertically, is 6 x 111, or 666." 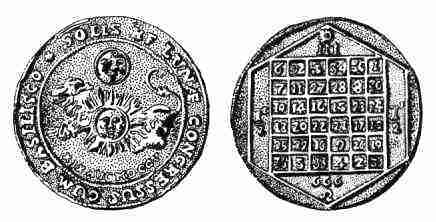 "The second illustration is also a solar seal, but it honors the star Basilisco, which was the diminutive form of the Greek basileus (king), thus meaning the same as the Latin regulus. Now, Regulus is the only first-magnitude star in the constellation of Leo. The sun and the moon are again clearly seen on this amulet, and on the reverse side is the same arrangement of numerals, with the actual figure given of the total 666." Source: Unfolding the Revelation (Revised) by Roy Allan Anderson, pages 125-127, Published and copyrighted 1953, 1961,1974 by Pacific Press Publishing Association, Boise Idaho, Oshawa Ontario, Canada. Library of Congress Catalogue Card No. 61-10884. 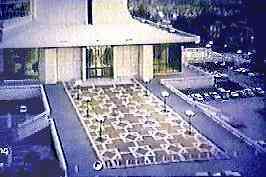 Table #1 as illustrated above is also referred to in numerology as the magic Square of the Sun. There are similar magic squares for Saturn, Jupiter, Mars, Venus, Mercury and the Moon, all of which have been known for centuries. 1 Pet 5:13 The church that is at Babylon, elected together with you, saluteth you; and so doth Marcus my son. Read what most *any* commentary says about the above verse and who "Babylon" is. There is absolutely no evidence that Peter ever ministered in literal ancient Babylon. However, early Christians used the term "Babylon" as a veiled code word for a particular city, so as to avoid persecution from that pagan power. That city is Rome. So the evidence presented here makes 666 a link between ancient sun worshipping pagan Babylon and the Papacy of the Roman Catholic Church, which is dominated by pagan practices and solar images, and referred to as Babylon in the book of Revelation. This is just a small part of the evidence that makes this relationship apparent. St. Mary's Catholic Cathedral in San Francisco. Notice the 3 rows of 6 circled crosses in the design. The circled cross is actually the ancient symbol for Baal and Shamash, the pagan Sun god! NOTE: 666 is the number of the beast, not the mark. Please see The Seal of God and Mark of the Beast. A Catholic Rebuttal by Mario Derksen. Seventh-Day Adventists and 666 by Bob Stanley. Sunday, the Sabbath, and the Mark of the Beast by James Aiken. In the above rebuttal by Stephen Haws, it is conceded that Vicarius Filii Dei applies to Peter, but he tries to make the case that it does not apply to Peter's successors. Was Peter the first Pope, according to Catholics? Yes, of course he was. Then Stephen Haws has in effect conceded that Vicarius Filii Dei is a genuine papal title.